AHLA is supporting Sexual Assault Awareness Month throughout April with events and media outreach to highlight the industry's work to protect employees and guests from sexual assault and harassment and to support other national organizations. AHLA’s 2019 Board of Directors issued an open letter in The Wall Street Journal to our valued guests, noting our long-standing commitment to raising awareness of sexual violence and providing hotel operators with new trainings, tools, and resources to educate employees on identifying and reporting sexual harassment and assault. 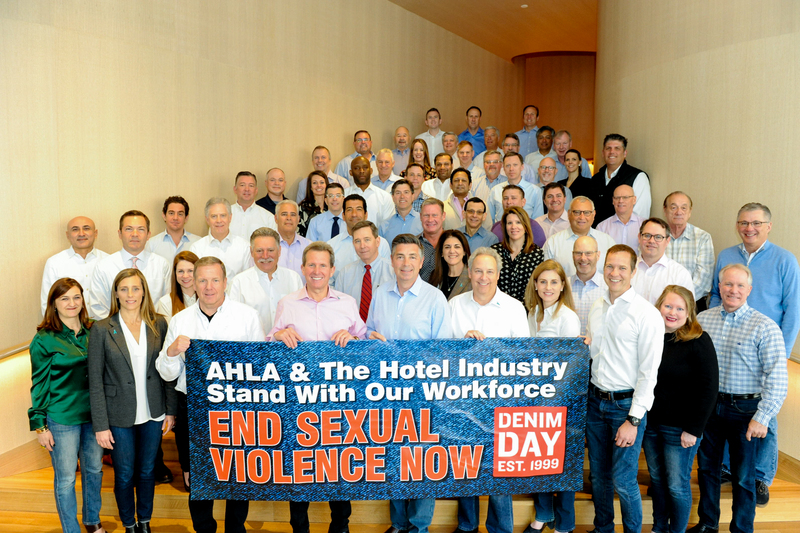 AHLA’s 2019 Board of Directors dressed in jeans on April 2 at its board meeting and will launch a social media campaign culminating in AHLA’s sponsorship of Peace Over Violence’s Denim Day on April 24. Check out the AHLA Member Sexual Assault Awareness Month Resource overview that provides additional resources and information on the hotel and lodging industry’s commitment on this issue and statistics around sexual violence.